Apple has spread the invitation for launch a new generation of their product, iPad 3. The launch of IPad 3 did not deter Google. In fact, Google believe that Android Tablet will be victorious beating iPad 3. Google's Senior Vice President of Mobile and Digital Content, Andy Rubin admitted that right now Android Tablet still lack a lot of thing. 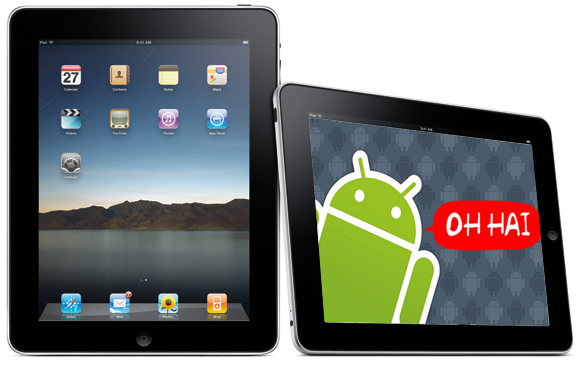 So far only about 12 million Android tablets were sold compared to the number of 55 million that reached by iPad. However, the rapid development of Android make Rubin sure that Android tablet will beat their competitors in 2012. Google and their partners will work hard to double the sales of Android Tablet. "Sales is not significant. It is still lower than I expected if you really really want to win. 2012 will be the year where we will double that and make sure we win," Andi Rubin said. Certainly, Android tablet has supported by so many large and small vendors. Google also confirmed that they will create their own Android tablet which will be launched this summer. Tablet that is supposedly called Nexus Android is claimed will be the highest quality of Android Tablet. Rubin also hopes to further strengthen the ecosystem of applications in the Android tablet. He want to make sure developers and consumers get the best experience. Especially encourage the developers to develop applications on the Android tablet. "We are now starting on the radar and I hope the people make their applications work great on a tablet (Android)," he added, as reported by WebProNews.